That was my first mtb which I started my racing ”career”, it was my first Cannondale. And it’s so well made in so many good ways. Really liked that Fatty fork. Really liked to be able to ride a 2×9 and 10 drivetrain with a Shimano Dura-Ace front derailleur. Really liked the light and clean wiring. 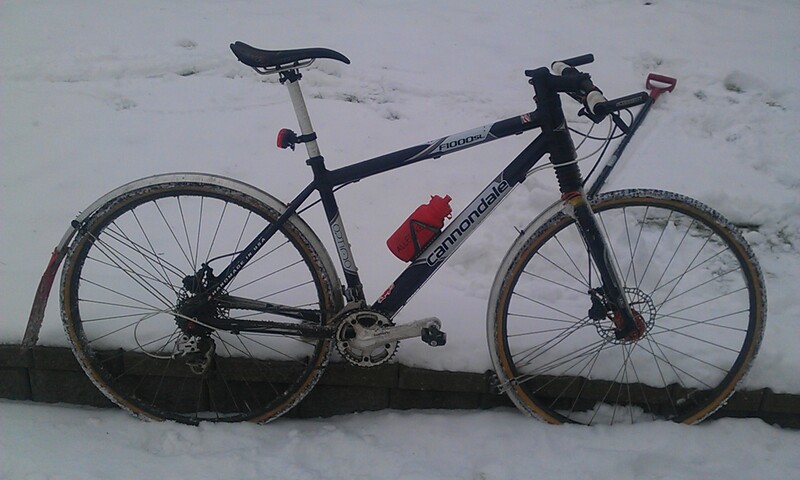 Really liked to be able to use a road crankset on a mtb for it as a winterbike. Really liked to get it work with 28″ Mavic Reflex rims and Challenge Grifo 32mm tubulars. Thanks to that bike I learnt a lot about biking but also as a mechanic because it had many different parts. Weight weenie style like on the picture with Tune King hub, New Ultimate handlear, Extralite barends, Aerozine QR, KCNC seatpost, Dura-Ace 7800 front derailleur, Tuned Sram Rival rear derailleur. Klicka för att ange e-postadress och få reda på när jag skrivit nästa inlägg.